Microfiber roller covers excel at applying lower VOCs, deep colors, and fast-drying coatings. Now The Wooster Brush Company is giving painters more microfiber choices by adding a 14" x 9/16" nap roller to their Micro Plush™ line. The Wooster Brush Company is giving painters more microfiber choices by adding a 14" x 9/16" nap roller to their Micro Plush(TM) line. 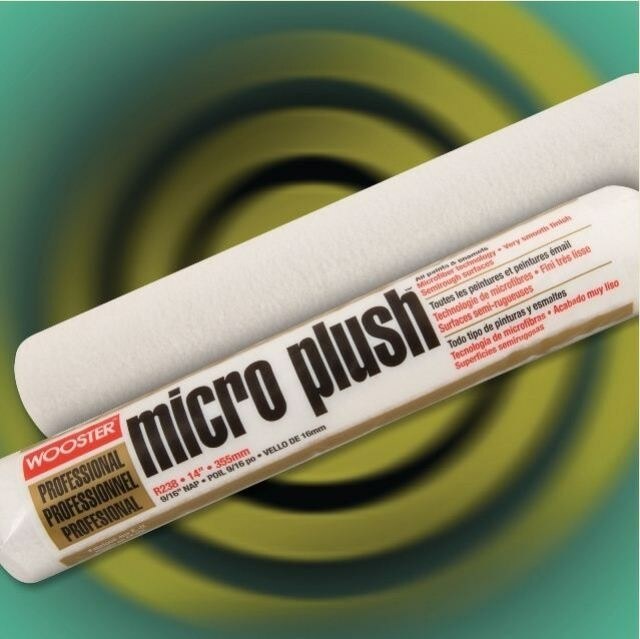 Micro Plush rollers are made using a soft white microfiber fabric that delivers a very uniform, even finish. Painters who use mohair or foam rollers will be pleased with the results Micro Plush achieves with all paints and enamels. These new 9/16-inch nap (R238-14") rollers are recommended for semi-rough surfaces and retail for approximately $9.49 USD. Micro Plush rollers are also available in 5/16-inch and 3/4-inch nap sizes as well as Jumbo-Koter® minirollers. Ask for Wooster Micro Plush roller covers at traditional paint and decorating centers, hardware stores, and paint sundry distributors or retailers. Established in 1851, The Wooster Brush Company is the oldest independent manufacturer of paint applicators in the USA. Based in Wooster, Ohio, the privately held company with 550 employees produces more than 2,000 products for both professional and DIY painters. Two industry standards--angle sash paintbrushes and synthetic fabric roller covers--exist today because of The Wooster Brush Company. Wooster tools are available at traditional paint and decorating centers, hardware stores, paint sundry distributors or retailers, and home centers. Learn more about The Wooster Brush Company at woosterbrush.com.